It's hard to believe how fast the year went by. It went by in a flash and as I get older, the years seem to pass even faster than ever. It's kind of scary when you think about it but as long as you make the most of your time on this planet, it's all OK. What really matters is not how much time we have left, but how we use that time. Reflecting back on this year, I am amazed at how much my life has changed. Major changes, new challenges and lots of ups and downs accompanied me throughout 2014 and boy was it a ride! I am so grateful to be doing what I love and I am certain that next year will only get better! I feel it in my bones! Speaking of 2014, it's about to end my friends and New Year's Day is just around the corner. Here in Japan, New Year's Day is the most important day of the entire year and the city is buzzing with the new year's preparations. Our decorations are up and the house has been cleaned. Now all we need to do is prepare the special dishes that are so important to this once-a-year occasion. All Japanese start off their day with a bowl of Ozoni. 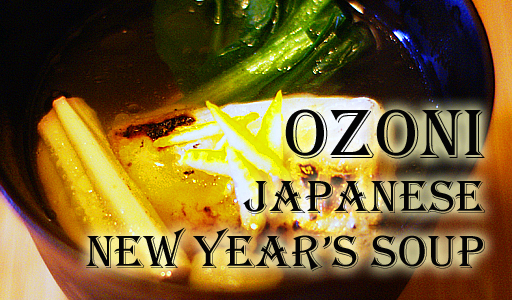 For those of you who don't know, Ozoni is a traditional Japanese soup but it gets a bit confusing. You see, it's prepared differently depending on where you live in the country. 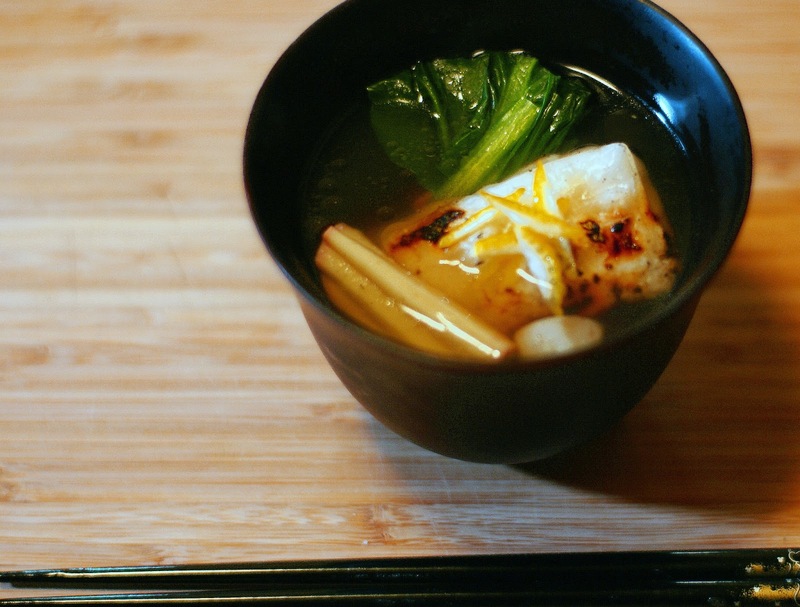 For example Ozoni is made with a white miso-based broth and round-shaped rice cakes in Kyoto while here in Tokyo, we prefer the clear dashi-based soup with square grilled rice cakes instead. Today I'm going to show you how to make Tokyo-style Ozoni because that's the way my mother used to make it. *We've also added FU ( round gluten balls ) but this is optional as it's difficult to find outside Japan. 1.Put the chicken with water into a saucepan. Cook for 3-5 minutes until just cooked. Do not overcook. Take it out and set aside. 2.Replace the saucepan with fresh water. Cook the komatsuna for 30-40 seconds. Take out and immediately immserse in cold water. 3. Squeeze out excess water out of the komatsuna. Place on cutting board and cut into 2-inch slices. Set aside. 4. Heat dashi in a pot to boiling. Reduce heat to low. Add chicken, kamaboko and Fu( optional ). Set aside. 5. Grill mochi in toaster oven or grill until the mochi puffs up. Watch carefully and don't let it burn. 7. Pour ozoni soup into individual bowls. Place mochi on top. 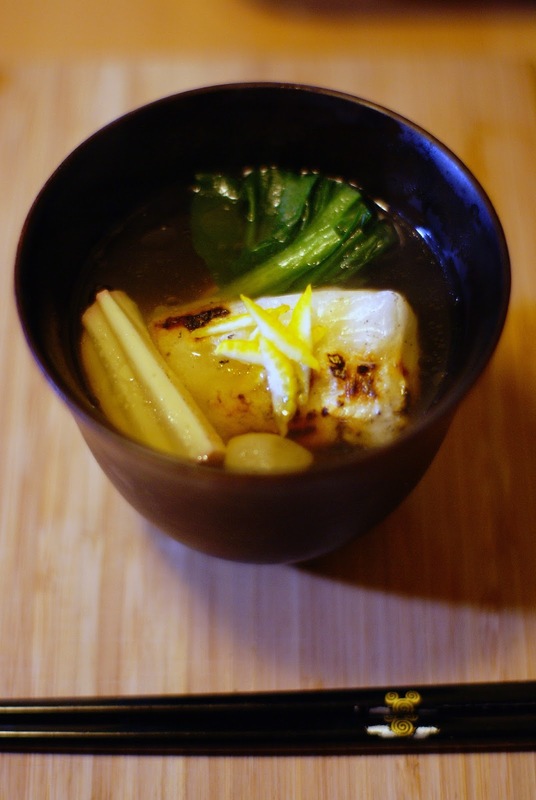 Garnish with komatsuna and yuzu. Serve hot. Here are some links to hard-to-find products. If you can't find fresh yuzu, yuzu juice makes a great alternative. We like this brand of mochi best. Easy to use and good too. As always thanks so much for reading. Subscribe to this blog, visit my YouTube channel and connect with me on social media by clicking on the social media icons on the sidebar. Thanks and hope you're all having a wonderful day! Our Very First Holiday Giveaway!! !